I have never experienced shame quite as profoundly as I have as a mother. On Monday I decided to walk to afternoon preschool with Gus. After dropping him off, I headed back with the three younger kids crammed into the stroller. A small park sits on the corner of our street. 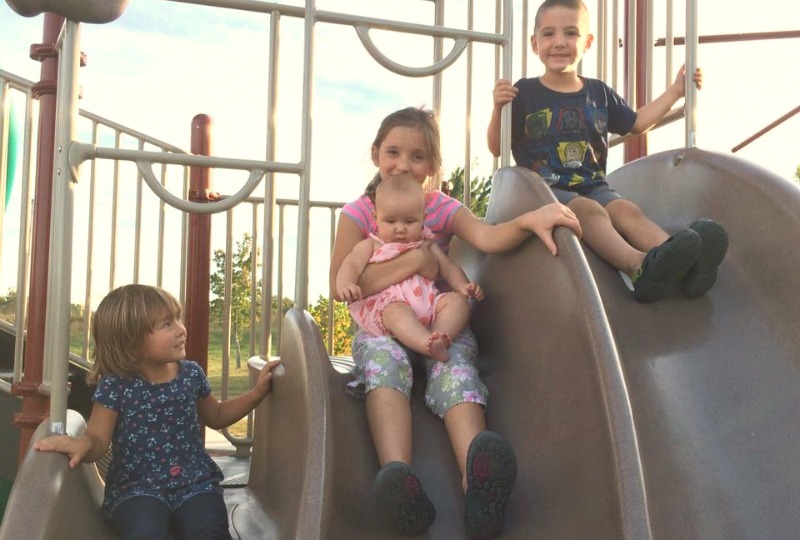 Bernadette and Dominic jumped off the stroller, cut through the grass and headed to the park. I was certain they knew I would meet them on the other side. Certain. And did I mention I was on the phone with my husband. So Josie and I marched down the block and up another, but as we approached the park I saw a woman across the street yelling and waving her arms frantically. And then another woman, toddler on her hip, darted out of her house on this side of the street, also yelling. What the hell are they so worked up about? I thought. And then I saw what they were so worked up about. My two children had clearly not understood me. After a moment’s fun on the park they had run back, thinking I would still be there on the sidewalk where they left me…and had been terrified when I wasn’t. They were wandering down to the busy street and in near hysterics as I, the negligent mother too busy gibbering away on her phone, finally tuned in. Some days I just feel like every other woman out there is killing it as a mom, while I’m here leaving my kids unattended by busy streets. And when I see my failure, my pulse quickens, my ears buzz, my stomach flips and I slide down the shame spiral where logic doesn’t exist and all I want to do is run away. It seems impossible that I have ever done anything right, or that we have any good memories. Which, of course, is just plain stupid. But that’s shame for you–and mom shame is the worst kind. I’ve been thinking about these slips down the shame spiral as a mother–and my undying need for mercy–a bit more this week after reading this honest and wonderful post. And for once I started thinking about all of my failings not as just failings, but as opportunities for mercy. 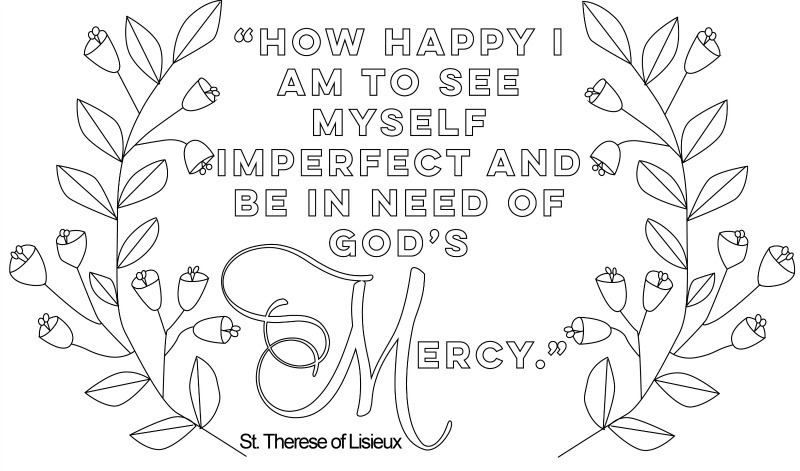 Although I have several beloved quotes from St. Therese, I am deeply in love with this one: “How happy I am to see myself imperfect and be in need of God’s Mercy.” Because I am deeply imperfect. Deeply. 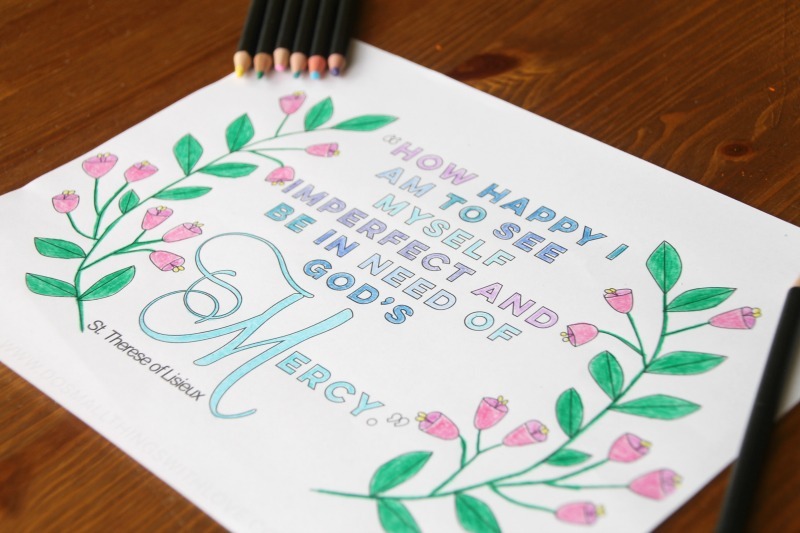 And, predictably, I made this beautiful quote into a coloring page for Catholic Mothers. I have been reading about the saints more lately and one of the things I love most about the saints in how they, without fail, make a fool of modern logic and common human thought. From the wit of St. Teresa of Calcutta and Pope John XXIII, to the bizarre courage of Joan of Arc, each and every saint seems to calmly and boldly remind us that we actually know very little. And that the things we spend time worrying over, are actually blessings. And so, although I plan to NEVER leave my children by a busy street again, I know that I will continue to fail. I will continue to forget things and loose my temper and fail to plan, and be selfish in a million ways. I don’t glory in my sin, but I glory in the love that God has for me despite my sins. I glory in His generous forgiveness. I glory in the blessings he dumps on me, despite my shortcomings, blessing I could never hope to earn in any way. 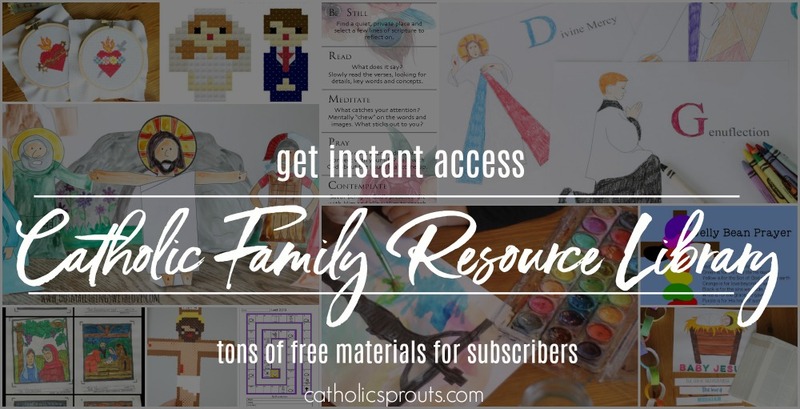 As I have mentioned before, I make these coloring pages for Catholic Mothers and I hope that they create a opportunity for prayer in your day. As you color, claim some quiet and let your mind work through the feelings of failure you might have–the feelings of shame you are still pulling yourself away from. Ask God for His mercy. 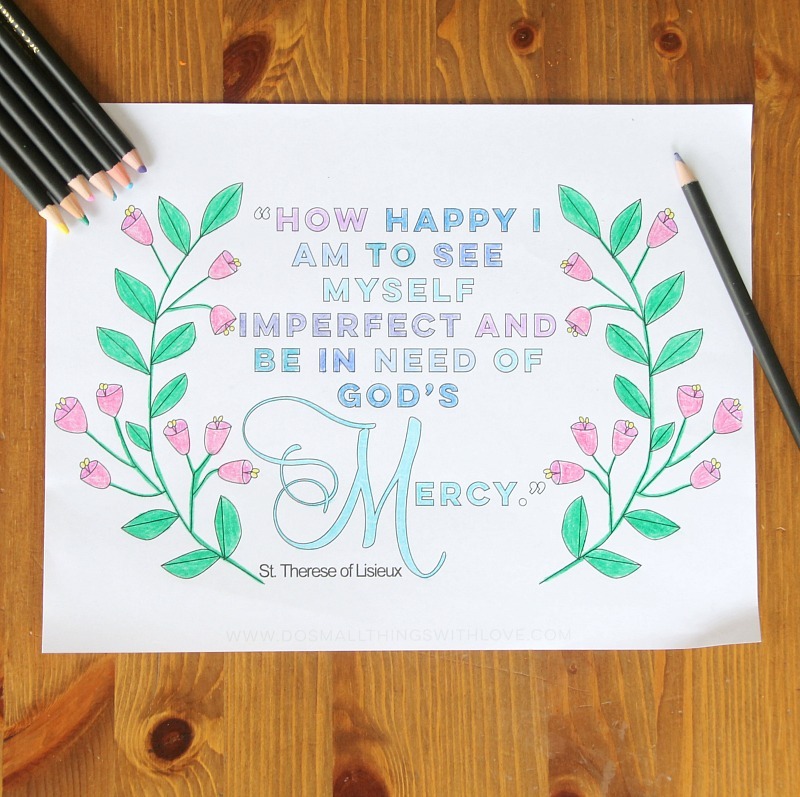 Quiet yourself and listen to Him, and once your coloring is done, tape it up to your mirror or fold it inside of you planner and remember that time with Our Lord. The coloring sheet is free.